I don’t even know if I’m nerdy enough to go for 29 hours of super hero movies. A convention full of scantily clad women… I can see that happening. Just watching movies though? Wow… that would be touch. I’d almost prefer running an actual marathon. Okay, not even close. I’ll take the 130 oz tub of pocorn and free Cheez Its anytime. Well except if it’s in L.A.
Captain America (Chris Evans) and Thor (Chris Hemsworth) in ‘Marvel’s Avengers: Age Of Ultron’ (Marvel). 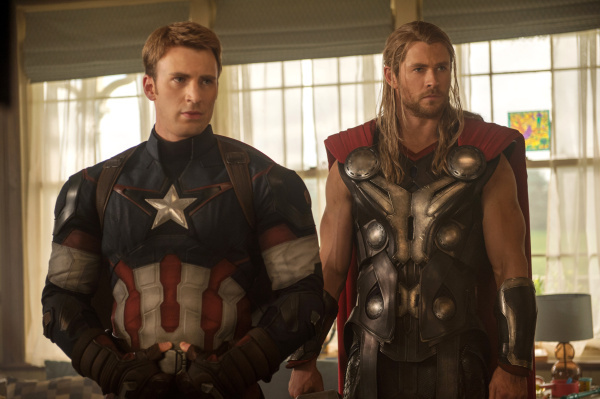 Think you’re the ultimate Marvel Cinematic Universe fan? L.A.-area viewers can prove their mettle by binge watching all 11 MCU films — including an early screening of the upcoming “The Avengers: Age of Ultron” — as part of the Ultimate Marvel Movie Marathon at Disney’s El Capitan Theatre in Hollywood on April 20. So much time, so much fun, it’s like a Marvel’s mini Comic Con… Why only in LA? I want to go too!